One of the biggest stumbling blocks I encountered after making the decision to severely reduce the amount of oil I used in cooking and baking was how to make salad dressing. I was completely stumped. Red wine vinaigrette with copious amounts of olive oil had been my go-to dressing. For ideas I turned to Ann Esselstyn’s recipes in Prevent and Reverse Heart Disease. They filled the gap, but I wasn’t thrilled with them; I needed a whole heck of a lot more flavor. Adding nuts to a basic oil-free dressing created that nice, creamy richness I craved and took the edge off of the tang of vinegar. From there it was just a matter of adding my favorite flavors. After you’ve made this dressing, be sure and make my Mexican-Spiced Roasted Vegetable Sandwich…It’s one of my most popular recipes. Rev up your salad with this spicy, tangy, beer-soaked yet oil-free salad dressing that just happens to be loaded with healthy ingredients. Combine all ingredients in a blender and process until very smooth. Where can I find Chipotle Tabasco? You’ll find it in the hot sauce aisle next to regular Tabasco – or just use some puréed chipotle in adobo sauce (mmmm!). I also just “found” Green Pepper Tabasco sauce – so good! I make all my dressings using nut butters and they are better than any I’ve ever had with loads of oil. I can’t stand oil now. 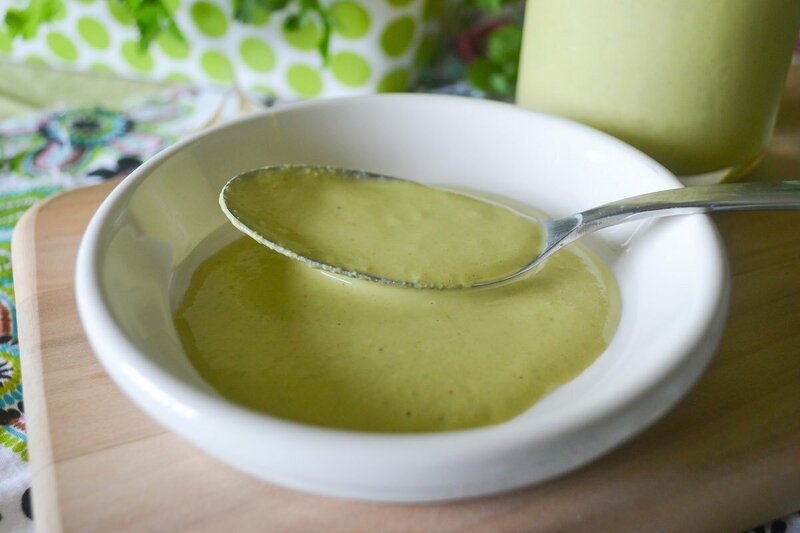 This cilantro dressing looks soooo delicious! I know it. Oil just makes dressing seem and taste very heavy. Beer! This sounds amazing! I haven’t experimented much with nuts in oil-free dressings but I loved the avocado-based one I made for the VVP. Gotta try this next! You get that same creaminess as with avocado – a really nice texture. Chipolte Tabasco sauce is my husband’s favorite go-to flavoring 😛 He goes through a bottle like every 1-2 months! Held love this, and the baby can have pumpkin seeds 🙂 I might see how it’d taste with all seeds and no cashews, so he can have it. I’m the same – I love this Tabasco flavor. Has your husband tried the Green Pepper Tabasco? It’s wonderful. Beer in a salad dressing? That’s a new one on me. I love your spicy background too. I’m always throwing in lots of black or red pepper in mine. The cilantro is brilliant to thicken as well. With all those flavors, the greens are really irrelevant…HE, HE! Oh yeah, I’m sure sunflower seeds would work. I bought a huge pile of cashew pieces (sort of like you and your stock of vinegar!) so tend to put a little in everything. I picked up some cilantro dressing to look at the ingredients this week and got immediately grossed out! There was junk I had never considered would go in a dressing… Bleck! Exactly right! Most Commercial dressings are scary. Thanks, Holly! **jaw hits floor** this is GORGEOUS! I’m forever inspired by your luscious looking dressings, Annie! Tonight is salad night for us and this is a game changer for sure! That’s an unusual recipe! And sounds good – I’m gonna try it. Thanks for sharing it with us! Nuts have become a staple in any sauce I make, they add depth that is just not found with most other oils and flavors! This looks and sounds amazing! I would love this on pasta! Hehe! You’re right – – and some of the best meals come out of those moments! What kind of green chilies do you use, Annie? Poblano? Anaheim? Jalapeno? I wonder how the dressing would taste if the chilies were roasted… Either way, I’m definitely making this. Thank you! Oh gosh…I used a can of roasted mild green chiles – not sure what kind of chiles! Hmmm…I think I’ll roast some poblanos. LOVE those guys! And they’re easy to get here in CA. Cheers! This looks so good, I love cilantro! I’m always looking for good salad dressing recipes… It always seems like so many dressings are so unhealthy, which is sad, because the salad you put them on is healthy! This looks amazing! Do you just use it on salad, or are there others you like to put it on? Wow so much flavour in there ! I have never heard of putting beer in dressing before- so interesting!! oh yum! this is totally speaking my language. Um, I think the salad dressing at Cafe Rio has some radical competition. I LOVE this! What do you recommend in Replacement for beer? More vinegar? Thanks! You could try vegetable broth instead, Bre. Can it be made in a food processor? Absolutely! Will probably take a bit more time to get it smooth – but should work just as well. Do you have any suggestions for substituting the beer and cashews? Hi Rebecca – just omit the beer completely if you like and add broth or water instead. For the cashews, you can try sunflower seeds or even almonds. wonderful, thanks for the advice!